MailChimp is a leading email marketing service with over 1 Million users. Merchants using our eCommerce platform in conjunction with MailChimp are in luck! Every 10 minutes, our platform will automatically push updated customer, order, and affiliate information into predefined MailChimp Lists. This makes it incredibly easy to use MailChimp in conjunction with our eCommerce platform. There are no customer lists to export and then import, data flows seamlessly. In instances where you want to use our system to segment customer data, you can run custom queries and push the results of those queries directly into MailChimp. For example, let's say you wanted to use MailChimp to send a special message to all customers who have purchased a specific product to let them know about a great new accessory. The merchant can run that query in Nexternal and push that data into a special MailChimp list. All successful online merchants leverage email marketing and now it is easier than ever. Best of all, our eCommerce Platform works with MailChimp's eCommerce 360. This allows you to track revenue by email campaign. By optionally pushing order data into MailChimp, you can also make use of the MailChimp's auto-responder feature which is extremely powerful from a marketing perspective. Sign up here to give MailChimp a Try. You can send up to 12,000 emails per month for free (no contracts, no credit card required). 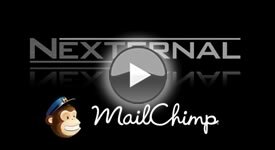 We think you'll love this program, but if you would like to see how what other Nexternal Customers think, please read our MailChimp reviews.